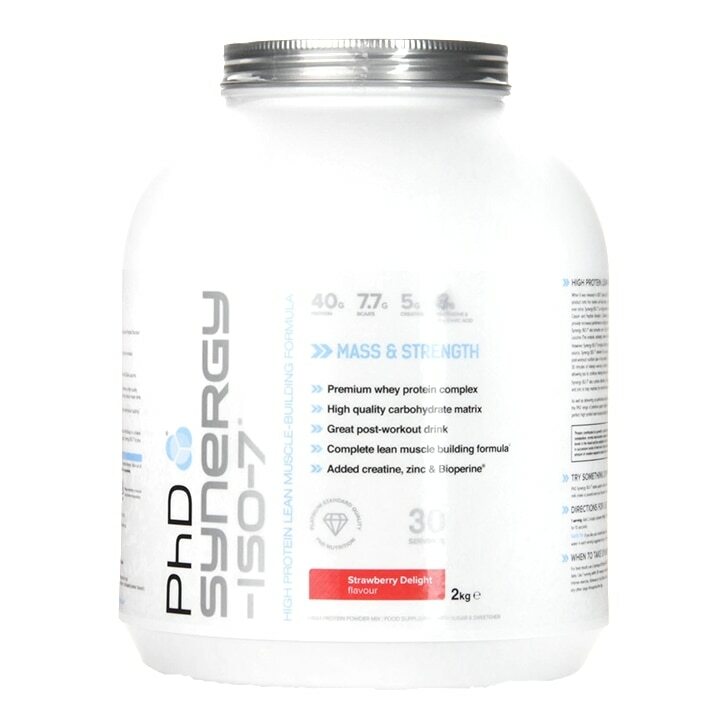 PhD Synergy ISO-7 Powder Vanilla Creme is the answer to the all in one conundrum, and is also an answer to the prayers of those seeking complete nutritional synergy. Synergy ISO7 is a premium product designed to maximise the various needs of all modern day athletes. Modern living demands we all have busy lives and these time constraints can often seriously hamper our nutritional choices. It is not very often that we have time to eat 6 times daily, let alone find time to take the individually packed supplements we need to progress. With Synergy ISO7, all result producing supplemental requirements are taken care of in one great tasting vanilla creme flavoured shake. Take 2 servings of synergy-ISO-7 daily. Use 1 serving 60-90 minutes prior to a workout ,with the second serving either immediately after the workout to assist repair and replenishment, or at anytime other time during the day. On non-training days, simply use 2 servings throughout the day, 1 serving in the morning and the second serving during the evening. PhD Synergistic Protein Blend (Whey Protein Concentrate (Milk) , Whey Protein Isolate (Milk)) , PhD Muscle Volumising matrix (Micronised Creatine Monohydrate, Micronised L-Glutamine, Taurine), Fat Reduced Cocoa Powder, Maltodextrin, Dextrose, Dietary Fibres (Acacia Gum, Chicory Inulin), Fructose, Olive Oil, Sodium Carboxymethylcellulose, Xanthan Gum, Flavouring, Mineral Blend (Magnesium Oxide, Zinc Oxide), Vitamin Blend (Ascorbic acid, Vitamin E, Pyridoxine), Methoxyisoflavone, Sweetener (Sucralose). PhD Synergy ISO-7 Strawberry Delight Powder is rated 4.7 out of 5 by 3. Rated 4 out of 5 by MrWatsano from Good product. I was surprised how nice this product actually tasted. More importantly it's a great recovery drink after you body takes a beating during excessive exercise. In my opinion it's right up there with the Maxi - Muscle products. Rated 5 out of 5 by limbu94 from excellent product I really like this protin shake, it has a good taste and works good aswell.